With Seattle’s head tax apparently dead, businesses that opposed it signaled a desire to re-engage in search of solutions to the worsening homelessness crisis. Advocates for homeless people say more funding is needed to address the issue. The Seattle City Council’s apparent reversal of the $275-per-employee head tax would deliver a major victory to businesses whose political influence has waned in recent years, while blind-siding homelessness services providers by wiping away their biggest achievement. Leaders from both groups cautioned that while the homelessness response cannot slow down amid an ongoing emergency, the way forward was unclear and glimpses of common ground were fleeting. In statements and interviews Monday, businesses treaded carefully, expressing satisfaction at the expected outcome — driven in large part by the repeal initiative campaign they financed, which tapped into vocal dissatisfaction. But they also signaled a desire to re-engage with regional government leaders in search of solutions to the worsening homelessness crisis. The announcement of the proposed repeal comes two weeks after King County’s annual homeless count revealed a 4 percent increase, with a steep rise in people living in their vehicles. Some service providers, who were anticipating a surge in city homelessness funding from the head tax, lamented the aggressive campaign against the tax. “The onus is very much on those who fought so hard against this solution to identify a better one, or admit they’re OK with the city having shanty towns and favelas in our public spaces indefinitely,” said Lisa Daugaard, a member of a city task force whose recommendations formed the basis for the head-tax proposal. Others decried the council’s lack of political will. “If this is not the solution, then what? We do need to do more than just talk about it. It does need to be addressed,” said Patricia Hayden, co-chair of the Seattle Human Services Coalition and chief program officer for the YWCA of Seattle. Marilyn Strickland, president and chief executive of the Metropolitan Seattle Chamber of Commerce, said the chamber is “ready to work on solutions — from employment, to technological innovation, to housing.” However, the chamber declined to participate in the revenue task force whose findings led to the head tax. Denise Moriguchi, chief executive of longtime Seattle grocery company Uwajimaya, has emphasized that the tax would affect not just technology giants like Amazon — the rhetorical target of head tax supporters — but also family-owned grocers and other businesses. Her company, which contributed to the repeal initiative campaign, would be subject to the tax, which would apply in 2019 to businesses with $20 million in annual revenue in the city of Seattle. She said Monday she appreciates the council’s responsiveness to concerns of businesses and Seattleites who spoke out against what she called “reckless spending” and an “ill-conceived proposal to tax the very businesses which provide jobs, generate tax revenue and provide support to organizations that help address homelessness. “I strongly believe that there is a better way forward, one that improves current spending efficiency and effectiveness all while encouraging economic growth and job creation,” she added. Amazon, also a contributor to the initiative campaign, did not respond to a request for comment. The head tax negotiated by Mayor Jenny Durkan and passed unanimously by the council last month was lowered to an amount that Durkan hoped would appease Amazon. The company never expressed public support, but it restarted a building project it had paused after the head tax passed. Even without a head tax, Seattle’s business taxes are substantially higher than those of most other Washington cities. The trade-off includes the amenities of a major city and the talented workforce available here. But for low-margin grocery and retail businesses in Seattle, which employ many entry-level workers and have competitors in lower-tax jurisdictions nearby, the accumulation of taxes and regulations in recent years is becoming a significant burden. They cite the $15-an-hour minimum wage and soda tax, among others. 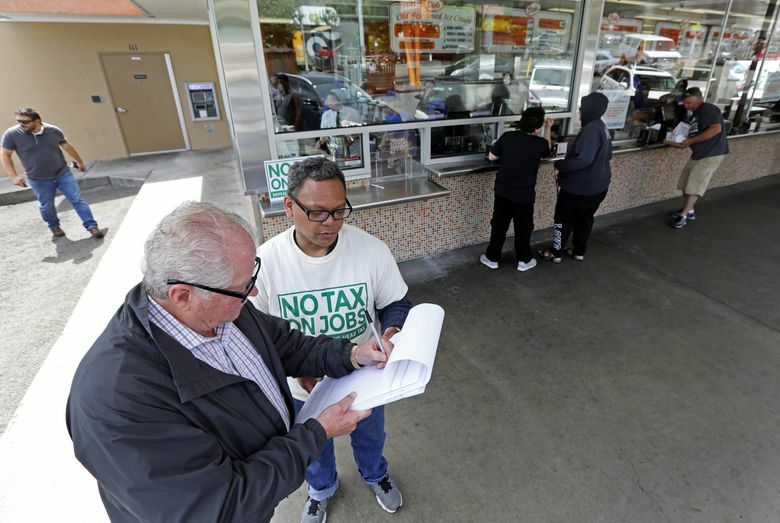 “You can’t just pass every cost that the city creates on to your consumer when your consumer has other options,” said Terry Halverson, chairman of Metropolitan Market, which has four of its seven locations in Seattle and would be subject to the head tax. His concerns about previous taxes and regulations fell on deaf ears at City Hall, he said. Halverson said he’s hopeful that the head tax turnabout is a sign that the council is becoming more responsive to businesses. He likewise hopes businesses will become more engaged in the homelessness issue. Metropolitan Market, he said, wants to join the mayor’s One Table task force, a joint effort between cities and King County that was partly created to find an alternative to taxing Seattle’s businesses. The One Table effort stalled during the head-tax debate and another meeting of the group isn’t even scheduled. But it stands as the only regional approach to homelessness in play. In any case, homeless advocates say more funding is needed to address the crisis. Daugaard, with the revenue task force, was less hopeful because the head tax was crushed without an alternative plan in place. Editor’s note: While The Seattle Times Company would be affected by the head tax, and the editorial board has commented on it, The Times’ news coverage is separate from those functions and remains independent. Benjamin Romano: 206-652-6593 or bromano@seattletimes.com; on Twitter @bromano. Vianna Davila: 206-652-6550 or vdavila@seattletimes.com; on Twitter @viannadavila.